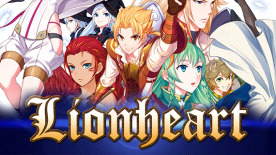 The youth known as Leon Lionheart, an adventurer like his father, seeks to explore the Magic Labyrinth, "Libra Corridor." Around the same time, the Justicar Maria Sinkirk finds Leon while on an investigation of the corridor, and, noticing the unusual "skill" he possesses, somewhat forcibly enlists his cooperation. The former mercenary Orsin and nun Emma also join the two, and the group begin to explore the depths of the Corridor.